UK Gardens – Starting in Scotland’s elegant capital Edinburgh, embark on a tour to some of the most remarkable and outstanding gardens in the UK. As the tour heads south you will explore some of the classic gardens of England often combining with visits to impressive castles, ornate stately homes and historic manor houses. Arrive in Edinburgh transfer to hotel. Welcome dinner tonight in the hotel. Edinburgh, the capital of Scotland and home to the Scottish Parliament, is without doubt one of the most attractive places in the UK. It is Scotland's compact, hilly capital and has a medieval Old Town and elegant Georgian New Town with gardens and neoclassical buildings. This morning visit the Edinburgh Botanic Garden, one of the world’s finest botanic gardens. This afternoon visit Broadwoodside garden, located south of Edinburgh. Noted as “one of Scotland’s finest contemporary gardens,” this private garden is planted in and around a rescued farm site. Depart Edinburgh this morning and head north crossing the Forth Road Bridge en route to Southern Hemisphere Botanics at Crombie Point. Created by the late botanist Ursula McHardy and her daughter, Lorna, this private garden reflects the owner’s passion for plants from New Zealand, Australia, South Africa and South America. Followed by a visit to Culross Palace, Royal Burgh of Culross. The most complete example of a Burgh of the 17th and 18th centuries, this National Trust site features a model garden including vegetables, culinary and medicinal herbs, and ornamental shrubs. Continue to Drummond Castle Gardens in Perthshire. The 2nd Earl of Perth first laid out these magnificent parterre gardens in 1630. At their centre is a multi-faced obelisk sundial that still indicates the time all over the world. Leaving Perth, head into the Scottish Highlands, passing Loch Tay and the Falls of Dochart on your way to Oban, which occupies a beautiful setting on the Firth of Lorn on Scotland’s West Coast. Today you visit Branklyn (near Perth). This two-acre National Trust garden overlooks Perth and contains an impressive collection of rare and unusual plants. Continue to Aberfeldy for a visit to Cluny House Garden – a superb woodland garden created by Bobby & Betty Masterton. The Masterton’s had a particular interest in Himalayan plants, which thrive in the garden’s perfect conditions. Afterwards visit Dewar’s distillery in Aberfeldy. The spiritual home of Dewar’s Scotch, this Highland distillery serves as a whisky heritage centre while continuing with production. • Arduaine Garden, Arduaine - This coastal garden contains a wide collection of plants from the temperate world, particularly East Asia and South America. • Armaddy Castle Gardens in a most spectacular setting, are shielded to the north by mature woodlands, carpeted with bluebells and daffodils and protected from the Atlantic winds by the elevated Castle. Wind your way out of the Highlands and return to Edinburgh via Stirling where there will be a chance to visit the grandest of all Scottish Castles. Nearby you shall pass the Monument to William Wallace, the inspiration for “Braveheart”. Continue this afternoon to Dun Ard near Fintry. This private garden, created by Alastair Morton and Niall Manning, is designed as a ‘journey’ with vivid contrasts and exuberant plantings, and is called ‘the most thoughtful and brilliantly executed contemporary garden in Scotland’. 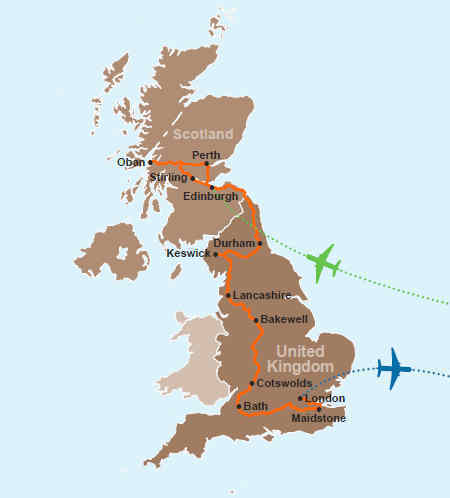 Depart Edinburgh this morning and travel south through the borders region. Visit Manderston, one of the last great classic houses to be built in Britain, which has magnificent formal terraces overlooking a lake to a woodland garden on the far side. Cross the border into Northumberland and continue this afternoon to The Alnwick Garden. Created by the Duchess of Northumberland in the past ten years, it includes the country’s largest collection of European plants, the shooting jets of the Grand Cascade, interactive water sculptures, the infamous Poison Garden and one of the world’s largest wooden tree houses. Continue afterwards for a visit to the Alnwick Castle. Depart Durham this morning for a visit to Belsay Hall. Explore the grand medieval castle, later extended to include a magnificent Jacobean mansion, then Belsay Hall, an architectural masterpiece inspired by the temples of ancient Greece, with its fabulous Pillar Hall and finally the huge grounds, packed with an impressive array of shrubs and flowers. Continue this afternoon across the Pennine Hills, often called the backbone of England, a wild landscape of open heather moors and peatlands, into Cumbria. Visit Levens Hall with a garden dating back from 1694. Through a combination of circumstance and love the gardens at Levens Hall have survived in their original design. The topiary is among the oldest in the world and justifi ably famous. The historic topiary garden also incorporates a small orchard of apple trees and medlars, a nuttery and herb garden, a bowling green, a rose garden, herbaceous borders and seasonal bedding. This morning visit Holehird. This garden is run by the members of the Lakeland Horticultural Society to promote ‘knowledge on the cultivation of plants, shrubs and trees, especially those suited to Lakeland conditions (where there is a very high rainfall). Early this afternoon there will be a cruise on Lake Windermere, the largest of the lakes. Later this afternoon is free for independent sightseeing and shopping or optional visits to Hill Top - home of Beatrix Potter and Wordsworth’s Dove Cottage. Depart Lake District this morning. Driving south into Lancashire we visit Gresgarth Hall. Since moving here in 1978, world-renowned landscape designer and plantswoman Arabella Lennox-Boyd has created a wonderful romantic garden, combining the best of Italian style and British plantmanship. The gardens include lavishly planted terraces leading down to a lake, wild and bog gardens, large herbaceous borders, an extensive walled kitchen garden, a magnolia and rhododendron hillside and a serpentine beech walk. Continue this afternoon to Biddulph Grange, an amazing Victorian garden created by Darwin contemporary James Bateman as an extension of his beliefs and scientifi c interests. His plant collection comes from all over the world – a visit takes you on a global journey from an Italian terrace to an Egyptian pyramid, via a Himalayan glen and Chinese-inspired garden. Discover the fabulous collection of rhododendrons, dahlia walk and oldest surviving golden larch in Britain, brought from China by the great plant hunter Robert Fortune. Afterwards drive into the heart of the Peak District National Park, an area of outstanding natural beauty. 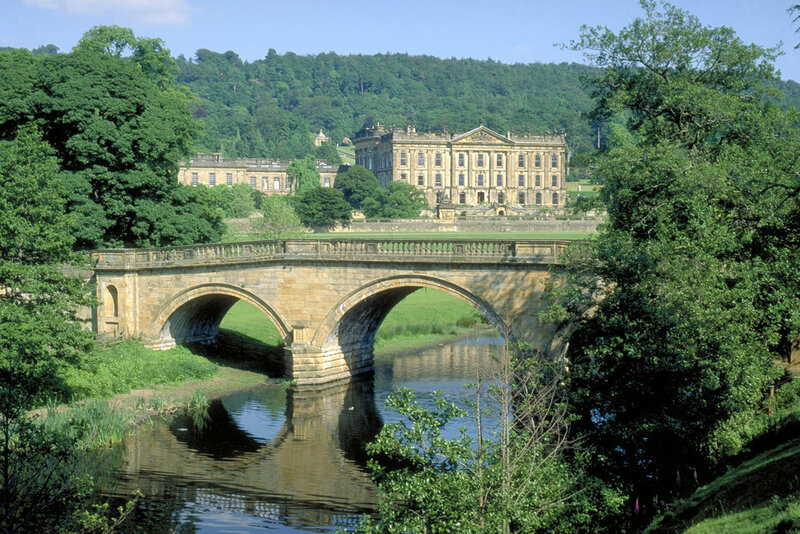 This morning visit Chatsworth House and Garden, home of the Dukes of Devonshire, with wonderful collections of art, furniture and other treasures. Joseph Paxton, famous head gardener in the 19th century, created the gigantic rock garden, the enormous gravity-fed Emperor fountain, the beautiful Pinetum and glasshouses. The famous waterworks include the twenty four steps of the 300 year old Cascade, falling 200 yards down the hill, the magic of water shooting from the branches of the willow tree fountain, and the trough waterfall. As well as the huge maze, and the rose, cottage and kitchen gardens, there is a new sensory garden. 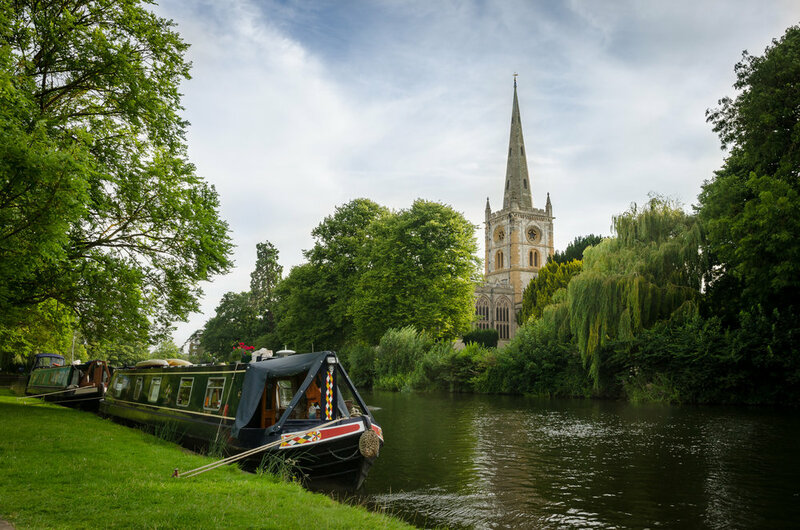 Continue south this morning via Stratford-upon-Avon where there willbe a stop to visit the Shakespeare’s Birthplace museum and spend some free time for sightseeing and shopping around this picturesque market town. Afterwards proceed to your hotel located in the beautiful region of the Cotswolds, famed for its picture postcard villages and gentle rolling countryside. 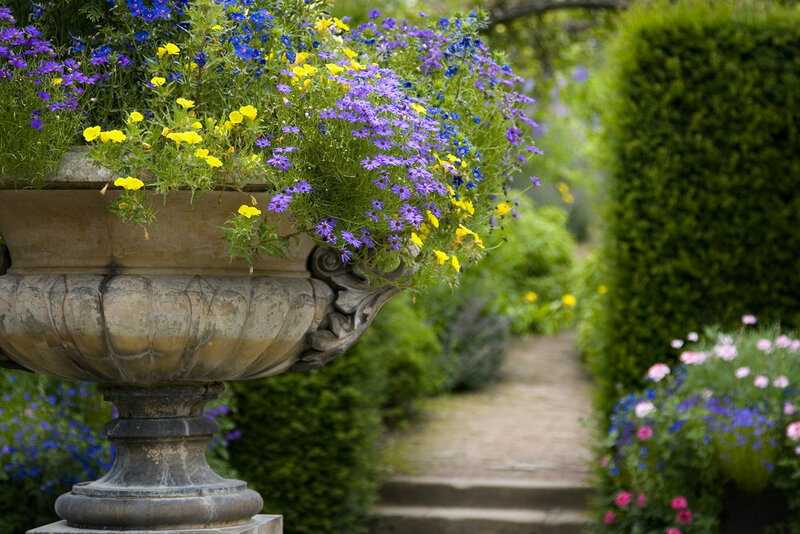 Today visit the gardens of Hidcote Manor. This is one of the most famous gardens in Britain laid out by Major Lawrence Johnston in the early part of the 19th century. The various garden ‘rooms’ here have influenced garden styles throughout Britain. Continue to the nearby garden of Kiftsgate. Developed by three generations of women, the gardens are a plantsman’s delight reflecting the pleasure the family has had collecting species from all over the world. At any time of the year there is something of interest to draw you back again and again. This afternoon visit Sudeley Castle, once the home of Queen Katherine Parr, Henry VIII’s sixth wife, who is buried in the church in the grounds. The award winning gardens are famous for their topiary and collection of old roses. Depart hotel this morning heading southwest. Visit Westonbirt Arboretum this morning. This afternoon continue to Stourhead Garden, probably the greatest surviving garden of the 18th century. Its vistas are superb along a rambling walk that takes you along lakes, through woodlands and by temples and grottos. This morning enjoy a sightseeing tour of Bath including a visit to the Roman Baths Museum. Visit the Peto Gardens at Iford Manor. Occupied since Roman Times, the secluded Iford Valley provides a welcome break from the pressures of modern life. A visit to the tranquil gardens is ‘like steeping into another world’ and has been described as ‘one of the most beautiful gardens in England’ There will be a guided tour of the gardens on arrival. Return to Bath with the rest of the day at leisure. Travel across the country, passing en route the famous Stonehenge where a strange prehistoric circle of massive stones dominates the open landscape. Visit Mottisfont Abbey set in the delightful Test Valley, where the River Test, the famous trout river, follows its journey to the sea. Mottisfont Abbey is famous for its Rose Gardens set within a walled garden. Continue to Wisley where the rest of the afternoon will be spent at the flagship garden of the Royal Horticultural Society. The garden never fails to inspire gardeners with its richly planted borders, trial grounds for flowers and vegetables, small model gardens and now of course, there is the state-of-the-art new Glasshouse to explore. Do not forget the shop with its huge selection of gardening literature. Today will be spent exploring some of the fi nest gardens in England. First we visit Merriments Garden near Hawkshurst. Created during the early 1990’s the beautiful gardens at Merriments have quickly developed into a stunningly beautiful 4 acres of densely planted borders where the plants grown in the nursery can be seen in a garden context with a truly remarkable depth of imagination. Continue to Sissinghurst Castle Gardens, perhaps the most famous of Britain’s romantic gardens, created by the poet and novelist Vita Sackville-West, and her husband, Sir Harold Nicholson. Utilizing the design concept of garden rooms and incorporating it with ruined castle walls makes this garden most spectacular. 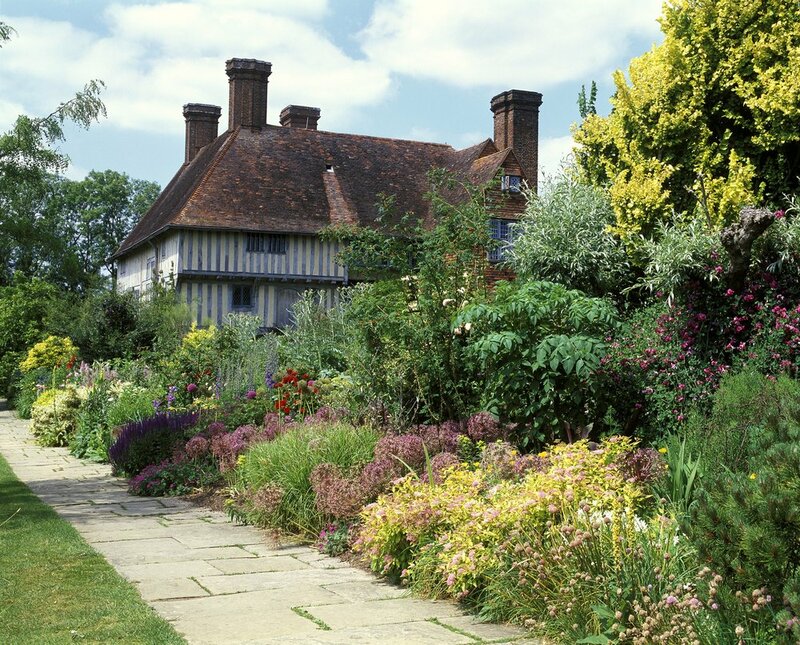 Later this afternoon visit Great Dixter, which has been the home of the Lloyd family since 1920 and where gardening writer Christopher Lloyd has continued the work started by his father, creating a series of colorful gardens. Depart hotel this morning and visit Hever Castle, the ancestral home of Anne Boleyn, Henry VIII’s second wife. The spectacular gardens at Hever Castle were laid out between 1904 and 1908 by Joseph Cheal & Son, turning marshland into the spectacular gardens you see today. One of the most magnificent areas of the gardens is the Italian Garden, which was designed to display William Waldorf Astor’s collection of Italian sculpture. Continue into London this afternoon. Stop at the Royal Botanic Gardens at Kew to see their colourful floral displays, numerous glasshouses housing plants from varying climate zones and magnificent specimens of trees and shrubs. It’s no wonder that they have been awarded World Heritage Site status! Visit to Chelsea Flower Show, Britain’s premier horticultural show of the year and a Mecca for garden lovers from all over the world. Leave when you are ready and have the rest of the day free for independent sightseeing or shopping. 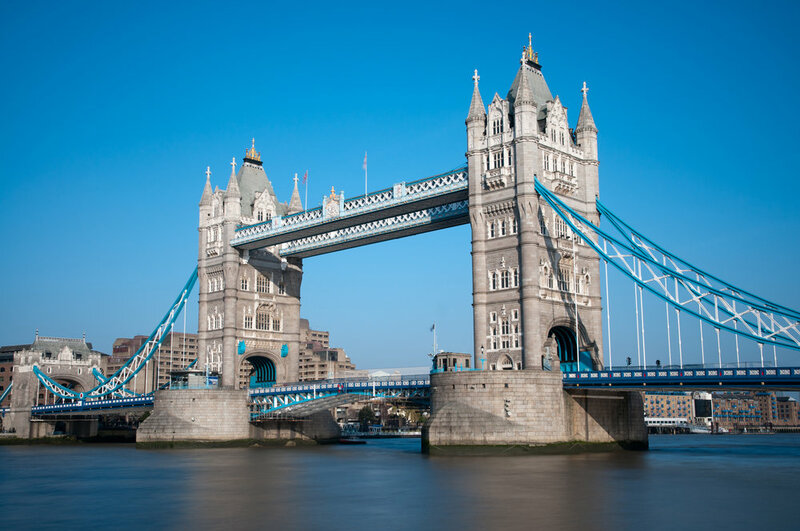 Day at leisure in London for sightseeing. Farewell dinner tonight in a nearby restaurant.